Does the employee have the proper attitude (desire) to perform the job? A. Suppose an employee that has the knowledge or skills required to successfully do the job, but not the desire or interest. This employee would fall in the upper left quadrant. The problem is Motivation. Job training is not indicated. B. 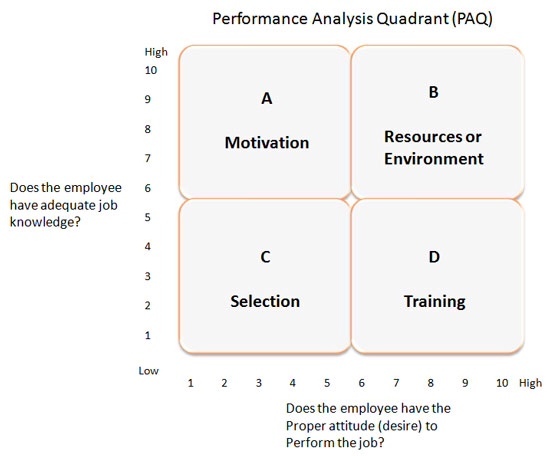 If for example, the employee appears to know their job and also have a good attitude and desire to perform, the issue would fall in the upper right quadrant. This indicates a Resources or Environment issue. Something is preventing them from delivering the desired performance. C. On the other hand, if the employee has neither the knowledge to do the job, nor the desire to perform then your issue is in the lower left quadrant. You have a problem with the Selection of this employee, and you may have the wrong employee for this job. D. Finally, if the employee shows interest and desire but just don't have the knowledge or skills necessary to succeed, then this places your problem in the lower right quadrant indicating that a Training solution would be appropriate. So we see that performance issues are not necessarily solved with training, but might instead call for a motivation solution, additional resources of some kind or a change in the external environment, or in certain circumstances replacement of the employee. In our next blog we'll focus on setting training objectives. For a free training needs assessment contact Art Johnson at johnson.art1@gmail.com or 480 249-4128. This entry was posted in Management, training and tagged business, education, learning, productivity, sales, sales training, training. Bookmark the permalink.